A plesiosaur I recently discovered in southern Utah. 90 million years ago southern Utah was a very different place. During the late cretaceous a shallow seaway covered much of what is now the central USA depositing the tropic / mancos shale. Global temperatures were much hotter than they are now causing glaciers and ice sheets around the earth to melt. It is also believed that the earth's mantle was in a much more active state at this time which caused the spreading centers of the ocean basins to speed up the production of oceanic crust. New oceanic crust is created in the center of the ocean basins by massive mountain ranges. These mountain ranges, the mid ocean ridges (MORs), start out very hot and therefore much less dense at the point where new magma surfaces. This newly created oceanic crust cools as it is pushed away from the MOR causing it to compress and become more dense. This gives the MORs the shape of a mountain. If this process speeds up, the MORs become much wider displacing water upwards and eventually onto land. Every continent around the earth experienced significant inland flooding during this period of the late cretaceous. The combination of much hotter temperatures, wider MORs, and no continental ice contributed to a massive rise in sea level. This paved the way for sea going reptiles to move into the central areas of the continent. The image above shows bones deposited in the bottom of this seaway after one of these creatures died. At this point plesiosaurs were the apex predators of the seaway, living and dying in the ocean. After one of these animals died, it would "bloat and float" to the ocean's surface. From there it would have been fed upon by any number of predatory animals. What was left would then sink to the bottom of the sea floor where it's carcass would host an entirely different ecosystem of animals. From the largest sharks to the smallest bacteria, the animal's carcass hardly went to waste and a lot of time nothing at all was left. Flesh and bones all consumed. Every so often the sediment being steadily dumped into this shallow seaway from the surrounding higher terrain would bury what was left of the carcass before it was fully consumed. By then these animals were usually a mess. One piece here, another piece there, spread out and disordered. This is what you can see in the photo below. There is a nice section of vertebrae still in order that abruptly ends. 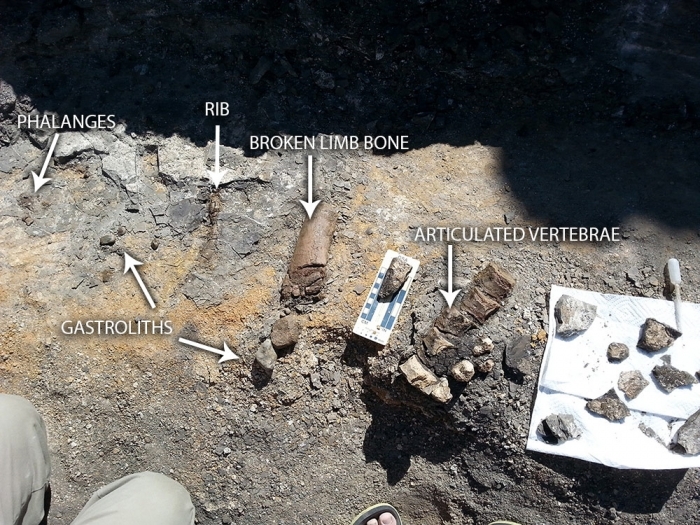 To the left is a limb bone, maybe a femur, that had been snapped in half most likely by a large predator eating the carcass. Mixed up with these bones are a rib, and lots of paddle material. Also in the mix are stones the animal would swallow for reasons still not fully understood. These stones, gastroliths, would reside in the animals gut for long periods of time possibly helping with digestion or buoyancy. After such a long time in the gut they became rounded with a shiny polished finish. It is rather rare to find an associated animal in these sediments. Hundreds of thousands have been lost to erosion over the last 70 million years as the Colorado plateau uplifted, and possibly many more remain still buried under miles of rock. When we look for these sites we are peeking at a mere snapshot of geologic time. The surface of an eroded hill which 1,000 years ago concealed the animal out of sight, and 1,000 years from now would have dumped it completely out into the streams and rivers below turning it into grains of sand heading for the Colorado river. It is a little miracle every time one of these animals is found somewhat intact. A shot of the quarry showing what has been exposed so far.